Each week the challenges change. I recall my sister-in-law once telling me, “Life as a parent never gets easier, it just gets different.” The same goes for being a daughter … “Life as a daughter never gets easier, it just gets different. 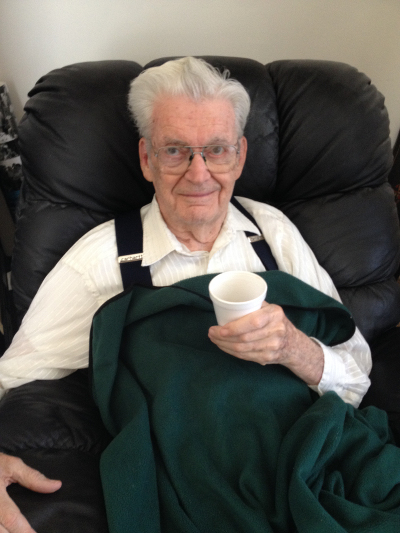 As I signed my name in the book I glanced over and saw Dad sitting in the dining room sipping coffee, alone at his table. I approached. He stared into space, eyes glazed, shirt stained, shoulders hunched. There is no question in my mind that shaving is no longer a priority, nor should it be. His walker was nowhere in sight. We returned to his room with his lukewarm coffee which he insisted on drinking in his chair before the task of showering, shaving and shampooing. Half an hour later, I still couldn’t get him to release himself from the comfort of his chair. I busied myself by gluing and clamping a broken chip of wood into another chair. I traced the shadows of the window shades as they fell upon my sketchbook. 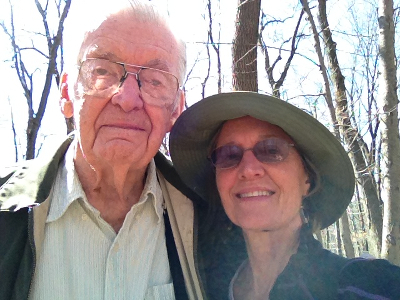 I sorted his newspapers, sifted through his laundry, made inventory notes on his calendar. Still, he wouldn’t budge. I handed him a pencil and his green book. 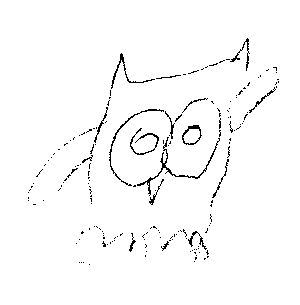 Dad smiled and set to work on drawing the owl and moved right along to writing his poem and agreeing to take a shower, though he remained grumbly about the idea of going shopping for new sneakers. Where do you start ! And go for it, – go NOW. Shave ….. Shower ….. (“Don’t forget to use that green shampoo when you wash your hair, Dad!” I shout through the door). He came out of the bathroom with wet hair, but the level of the shampoo remained the same, not falling below the line of the rubber band used to keep track of whether or not it’s being used. Halfway to the car I couldn’t bear to go shopping for sneakers. 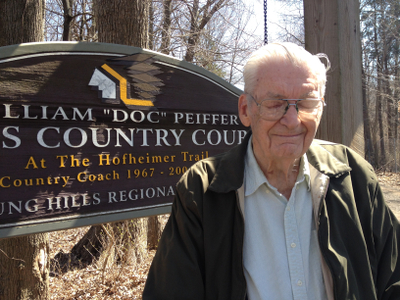 The day was gorgeous and Dad looked so happy being outside in the sun with the blue, blue sky above. 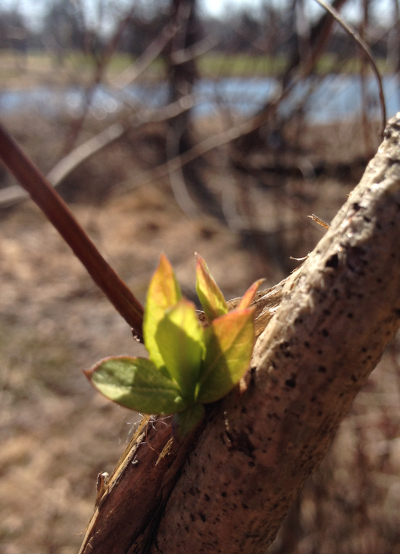 The wind was gentle and the air smelled of spring… finally. I parked far away from the trail head so that we could still get a decent walk in if we couldn’t get very far along the rooty, rocky path. The last time we visited Hofheimer Park we took the short path to the grotto. This time I wanted to try the whole loop, ending up at the grotto. Happy to be in the woods again! 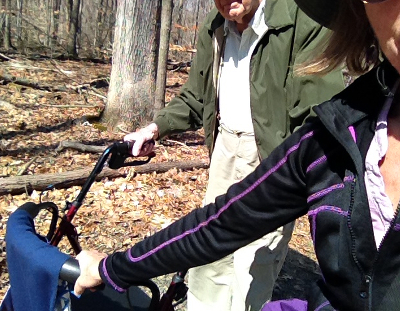 I missed sharing the giant beech trees with Dad. 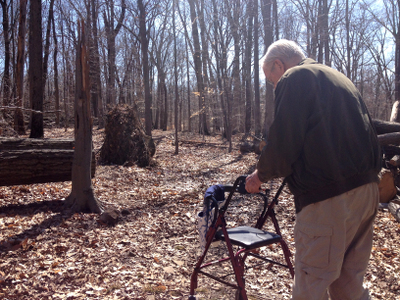 Severe storms had uprooted so many trees that the trail was too dangerous when Dad was using his cane for balance. Why did I think it would be easier with the walker? I didn’t. But I wouldn’t have to worry about Dad falling. We had developed a method for rough terrain last week at Lord Stirling Park. 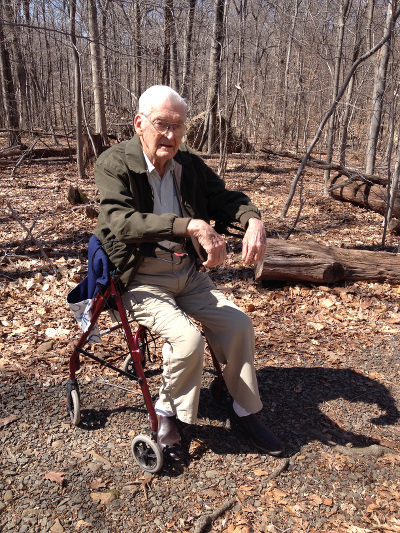 I walk ahead and slightly to the left with my right hand on the front of the walker to lift it slightly, keeping it from digging into mud, jamming against rocks or roots and making it easier for Dad to push. 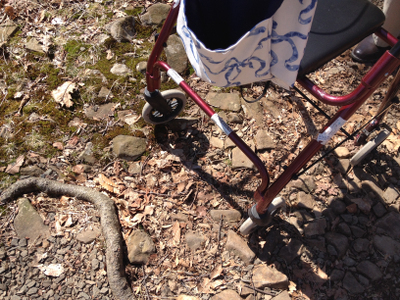 Lucky for me, I was hanging onto the walker when I stepped in a deep hole hidden by leaves. With each step Dad looked happier and more bright-eyed. His stamina amazed me. 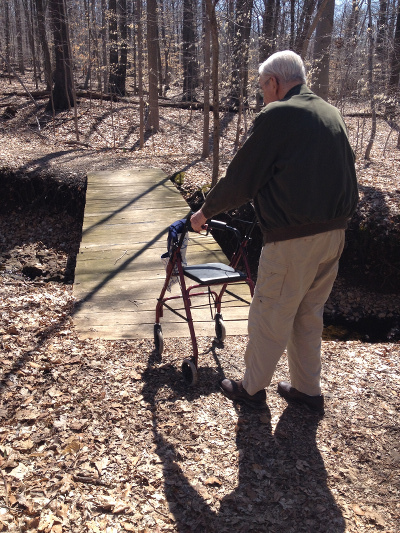 Walking on the boardwalk around the small pond at Chelsea tires him out more than climbing a steep trail over uneven ground strewn with obstacles while having both hands on an unhappy walker. He is not as happy walking around the pond as he is surrounded by the giant beech trees. We had reached the top of the hill and were on our way down before Dad requested a short break. There had been several short stops for him to blow his nose. Fortunately I remembered a paper towel this time. At Lord Stirling Dad had resorted to his tried and true method that he had learned as a boy on the farm. Dad taught me how to blow my nose without a hanky when we ran together in the morning before I boarded the bus for high school. I’m pretty sure Alexis is practiced at the method of nose-blowing while running. Dad has mastered the techniques. His dementia has not stolen from him his expertise. The visuals had been a bit dramatic last week and I made sure to stuff a paper towel in my bag this time around. As usual, we found treasures along the trail. “Looks like someone hit a home run, Chris ….. a long time ago. 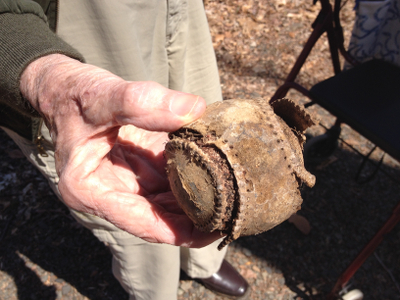 I bet that was a good day!” The tattered ball awoke memories of coaching my brother’s baseball team many, many years ago. That lead to memories of Dad and I running our first run together around the parking lot of the school where he coached Howard’s team. Dad had just purchased the first edition of Aerobics and wanted to test it out. We continued to run together until I left for Germany after graduating high school. Trees were terribly bare for this time of year. Spring has been so late in coming. A few bits of green appeared on tired branches. 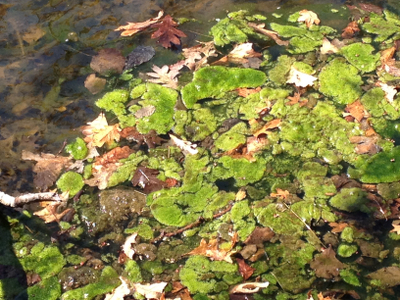 The algae glowed with the pride of being greener than anything else in sight. We made it all around the loop and stopped in at the grotto before returning to the car. There will be more good days to come and more not-so-good days to come. There will come a day when we will no longer be able to walk the rocky, rooty trails together. Almost at the bridge, but not quite yet. We’ll cross that bridge when we get to it. We may be close, but we’re not there yet. It is so great you can still do this with your dad. My sister can’t walk any more and just sits and eats and watches tv. She hardly talks any more either. Once in a while she asks a question. Lucky you to have this time with your dad. This is a wonderful posting. The love you have for your father and his for you appears in every picture and in your composition. Your writing was from the heart and it touched mine. Thank you for taking the time to read my posts. It helps to know that the adventures are being shared with others who might pass the stories along to their friends and families. My father doesn’t remember our adventures together. If I didn’t share them, these precious moments would be forever lost. My sibling wouldn’t be able to experience the special moments that still are possible when spending time with Dad. Thank you. Well done !! Thank you.